Though the community of Bhatigacha is less than twenty kilometers from Biratnagar, Nepal’s second-largest city, it feels like another world. Rutted lanes lead through fields bright green and yellow with harvest; cattle, goats, and poultry graze and wander around the farmyards; and in ponds and irrigation ditches, beautiful purple waterlilies bloom. It’s here, in a pretty pink house on a green lawn dotted with palm trees, that the Brethren in Community Welfare Society has its field office. BICWS is the service agency of the Nepal Brethren in Christ church denomination. The field office in Bhatigacha is one of the locations of BICWS’s vocational training program for local young people. With funding from Mennonite Central Committee’s Global Family program, BICWS provides scholarships to unemployed young people who can then access training in areas that suit their interests and abilities. Some of the most popular programs are pharmacy, tailoring, driving, community medicine/midwifery, and motorcycle and mobile phone repair. Currently, 70 students in 2 communities are receiving scholarships. 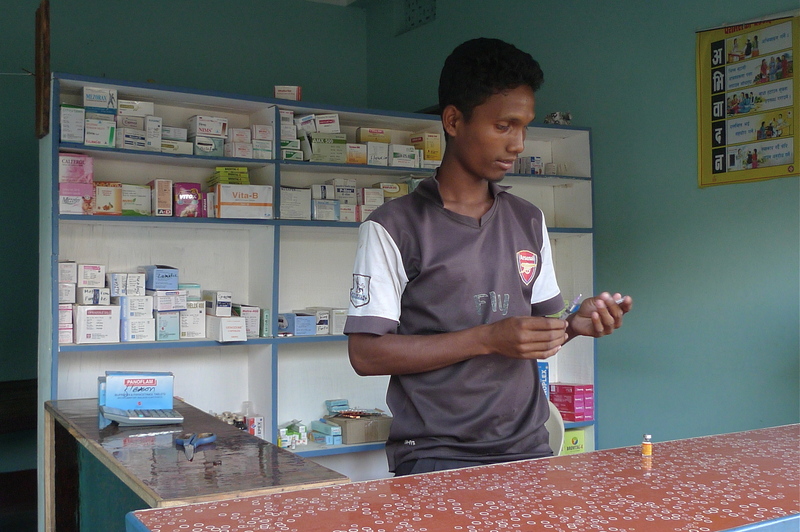 Rajis Hembrom, pharmacy student in BIC’s vocational training program, loads a syringe. Whereas many of his peers have no option but to migrate to India or other countries to seek poorly-paid work in exploitative conditions, his specialized skills enable him to earn a good living in his own community. For young people in this area, a skilled trade can mean the difference between a life of uncertainty and poverty on the one hand, and a life of purpose and relative prosperity on the other. An unskilled agricultural labourer usually makes at most 300 rupees ($3) for a hard day’s work in a landlord’s field, and is subject to the seasonal and unpredictable nature of agriculture. This wage often isn’t sufficient to sustain one person, let alone a family. In comparison, a plumber can make 800 rupees ($8) a day throughout the year. Students of the tailoring program speak to MCC staff at the BICWS Field Office. Seated on the floor is Poonam Thakur; behind her is her teacher, Hena Gurung, herself a graduate from the program, and Hannah Soren, of BICWS. One of the main goals of the program is to enable young people to make a good living in their own community. Underemployed Nepalis face the constant temptation to migrate to other countries, especially India, for work, and are often met with exploitation and unfair wages. The mass migration of unskilled labourers takes a heavy toll on the communities they leave behind. Since it’s usually men who go, families are left without their husbands, fathers, and sons for many months at a time. Often, families have to take out loans to pay for a labourer’s passage to India, and in many cases the low wages that the labourer brings back are not enough to cover the debt. While the migrant labourers invest all their hard work in foreign communities, their own communities suffer from a lack of development and economic growth. 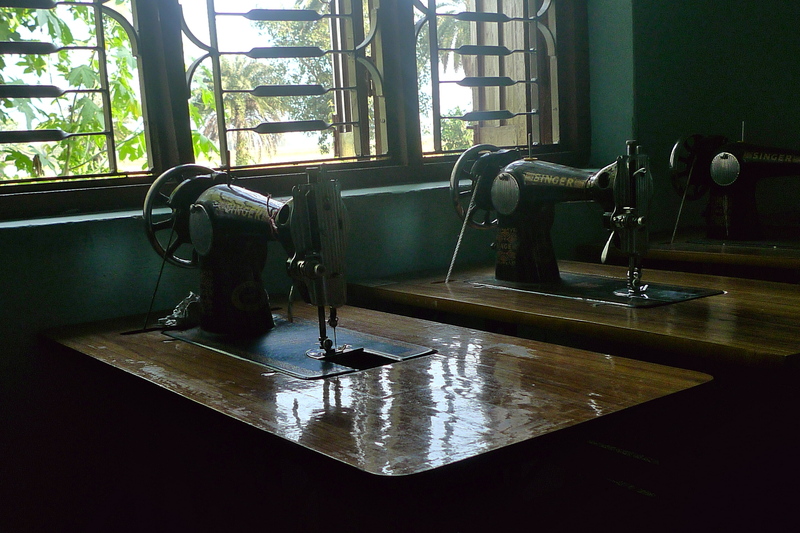 Sewing machines used by tailoring students at the BICWS field office. Initiatives like BICWS’ Vocational Training program help individuals and communities to escape this cycle. When people are able to do skilled work in their own communities, they not only avoid debt and exploitation, but also help to build up the future of their own country.